Celebrity chef Matt Moran needs no introduction. Since opening his flagship two-hat ARIA Restaurant in Sydney in 1999, the entrepreneur has gone from strength to strength. A highlight was 2012 with the opening of two new venues, CHISWICK restaurant in Woollahra and Riverbar & Kitchen in Brisbane. Oh, and did we mention he was also awarded GQ magazine’s Chef of the Year. 2. To prepare the gnocchi, spread the rock salt on a baking tray and lay the potatoes on top. Place the tray in the oven for approximately 40 minutes until tender. Remove from the oven and scrape out the inside of the potatoes. Mash the potato and then pass through a sieve. Combine the flour, eggs and salt with the potato and work into a dough. Roll the dough in a sausage shape (approximately 2cm in diameter). Cut the dough into 2cm wide discs. 3. Add the gnocchi to salted, boiling water. Cook until the gnocchi rises to the surface and then scoop out and refresh in iced water. Drain the gnocchi and then toss with a little bit of olive oil. Peel and deseed the butternut pumpkin and then dice into 1cm squares. Blanch in salted, boiling water for approximately 3 minutes, refresh in ice water and then drain. 4. Heat the vegetable oil in a frying pan and then add in the pumpkin and seasoning. Cook until the pumpkin is caramelised and then remove. In the same pan, add in the gnocchi and caramelise until golden. Season to taste. Stir in diced butter until it starts to turn into a nutty brown colour. Add in the sage and remove from the heat. 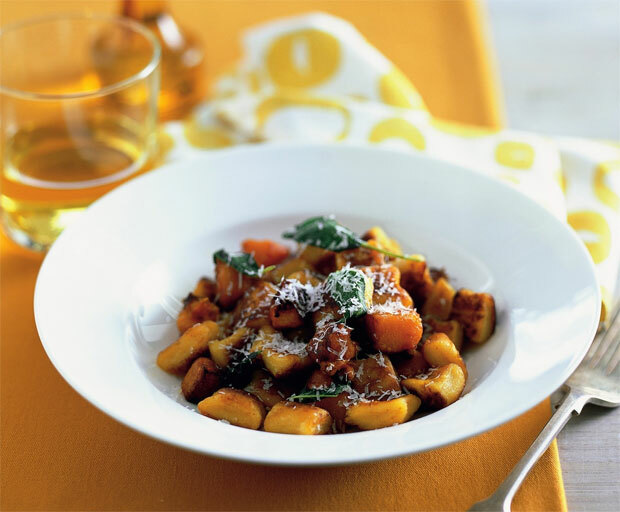 To serve, arrange the gnocchi and pumpkin on a plate. Drizzle over the nutty butter and then garnish with the sage leaves and freshly grated pecorino. 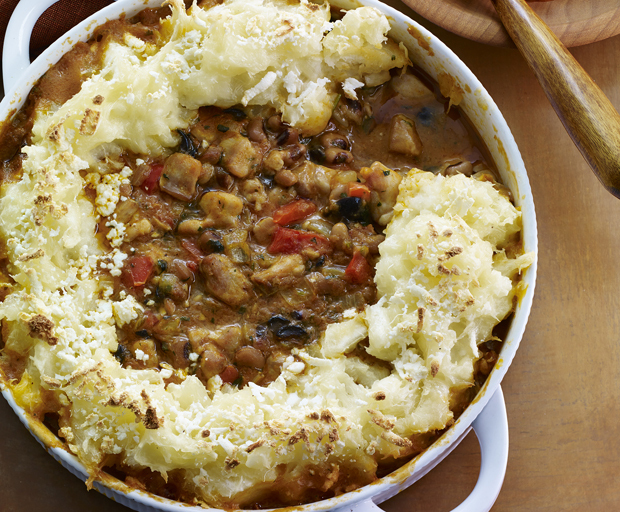 This rustic Brazilian chicken and bean casserole features a fragrant seasoning and is topped with your new favourite twist on mash – yucca, also known as cassava. For the Chicken & Beans, melt butter in large saucepan on medium-high heat. Add chicken, cook and stir for 5 – 7 minutes, or until browned. Add onion, pepper and Garlic. Cook and stir for 5 minutes, or until vegetables soften. Stir in tomato purée and Bahian Seasoning, sprinkle with flour and mix well. Add stock, black-eyed peas, olives, 3 tsp of the Coriander and the Salt. Bring to the boil, reduce heat to low and simmer for 5 minutes, or until thickened, stirring frequently. Spoon into a baking dish. Place baking dish on baking sheet and set aside. *Cooks tip: As an alternative to Romano cheese try using Parmesan cheese. If yucca / cassava is unavailable try using a mixture of half regular and half sweet potato mash. What’s your favorite South American recipe? Now that we’ve shown you how to do the ultimate summer detox, we’ve got some healthy recipes to help you stay on track, including detox smoothies, snacks, delicious low-fat lunches and easy dinner ideas. 2. Mix with rice, chickpeas and corn in a bowl. 3. Mix together ingredients for dressing and combine with the rice mixture. 4. Serve, with side salad if desired. 1. Mix garlic, oil, lemon juice and parsley in a bowl. 2. Thread vegetables onto wooden kebab sticks that have been soaked in water. 3. Brush fish and vegetable kebabs with oil mixture and cook on non-stick grill/pan. Turn and baste with more oil mixture. Cook until golden brown. 4. Serve with green salad and dollop of hummus. What are your favourite detox recipes? Recipes by Belinda Reynolds, Nutritionist, Dietician and educator for BioCeuticals. Speak to your healthcare practitioner for more information about supplementing your diet. Make sure to always read the label and use only as directed. If symptoms persist, see your healthcare practitioner. Looking for new beef mince recipes? Italian beef rissoles are one of our go-to easy dinner ideas, and the leftovers make delicious Italian paninis (both for you and the kids’ school lunch boxes!). 1. Preheat the oven to 180oC. Combine the beef mince with oregano and garlic. Form into 12 beef rissoles, then chill for 30 minutes. What are your favourite beef mince recipes? This high protein, low carb pasta recipe is one of our favourite dinner ideas for when the fridge is empty but you still want a delicious dinner. 2. Meanwhile, heat the oil in a large fry pan on medium heat. Add zucchini, garlic, chilli and lemon zest and stir fry until golden for about 5 minutes. 3. Remove the pan from the heat and add the lemon juice. 4. Drain pasta, reserving ¼ cup cooking liquid and return pasta to the pan. 5. Stir through the zucchini mix with cooked pasta, adding the reserved liquid if needed. 6. Combine the ricotta, lemon and herbs and set aside. 7. To serve, place pasta on each plate with the ricotta mix divided equally on top. What are your favourite empty fridge dinner ideas? When that laksa craving hits, nothing else will do! Masterchef contestant and Malaysia Kitchen Ambassador Billy Law shares his authentic Malaysian laksa recipe, one of our favourite easy dinner ideas. Make a batch of the laksa paste and it will last in the fridge for about 10 days, perfect for your next laksa craving. Laksa lemak or curry laksa is a coconut-based curry noodle soup well loved by many Malaysians. This dish is a perfect winter warmer but also great during summer when your tastebuds are dying for some fresh, spicy flavours – slurp up the steaming hot noodles with the coconut curry broth and know you haven’t fully enjoyed this dish if there aren’t any beads of perspiration on your forehead, although you can take the spice factor down a notch to suit your taste. And keep some napkins handy to avoid splashes on your shirt! 1. Pour water into a large stockpot and bring to the boil, then turn the heat down to a simmer, add the chicken and let it cook for 20 minutes. Reserve the stock, remove the chicken, set aside to cool, then shred the chicken into small pieces. 2. Meanwhile, put all the laksa paste ingredients in a food processor and blend to a fine paste. 3. Heat oil in a wok on medium heat, fry prawn heads for a minute, then add laksa paste and fry for a further 15 minutes. When it’s done, the paste should be dark brown and a layer of red oil will separate from the spices. 4. Tip everything in the wok into the chicken stock and bring to the boil. Pour in coconut cream, season with salt, add curry leaves and fried tofu puffs, then lower the heat and let the soup simmer until you are ready to serve. 5. Half fill another large pot with water and bring to the boil. For each serve, grab a small handful each of hokkien noodles and rice vermicelli, and a few prawns. Put them into a wire mesh strainer or a sieve and dunk the noodles and prawns into the hot water for 1 minute. Drain and shake off any excess water, then transfer to a serving bowl. Top the bowl of noodles with bean sprouts and chicken then ladle the hot laksa broth along with a few tofu puffs over the top. What’s your favourite Malaysian dish? Leftover cheese plate? Ham? Mince pies? I’ll admit it – I think Christmas leftovers are even better than Christmas lunch! I also don’t want to spend a ton of time in the kitchen after spending half the day in there on Tuesday! Here are my 5 go-to tricks for turning Christmas leftovers into something special – and no waste! 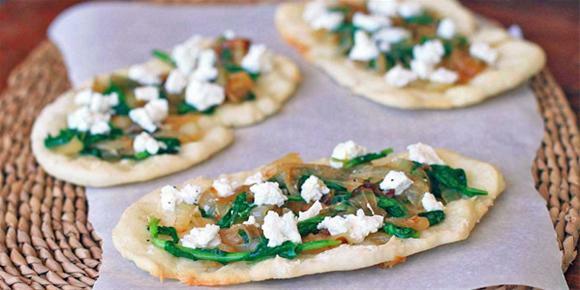 Take a large naan or pita bread and spread slices of cheese from your leftover cheese plate. Dot with pesto or caramelised onions, sprinkle with fennel seeds and bake in a hot oven for 10 minutes or until the cheese is melted and golden. Remove from the oven and sprinkle with chopped coriander. Cut into wedges and serve. Today we all need a little nourishment after all that gluttony. Grab that tin of lentils sitting in your pantry, tip it into a large pot with a chopped up carrot and celery rib, and add small chunks of leftover ham (and the ham bone if you have it). Top with a little water or leftover stock and simmer for 30 minutes. Sprinkle with parsley. Just the thing to get you through the next few days. Mince pies are great the first day but pretty stodgy by today, so take a tub of ice cream out of the freezer for 30 minutes to soften up, then crumble up your leftover mince pies (or half-empty jar of mincemeat) and stir it through the ice cream. Put back in the freezer to harden up – it’s even better the next day when the ice cream has had time to infuse with all those Christmas flavours. I know, leftover bubbly? It shouldn’t exist but I found a few near-empty bottles this morning and decided to turn it into refreshing sangria. Pour any leftover bubbly or white wine into a pitcher and top with chunks of fruit – cherries, apples and oranges are fantastic in sangria! Add ice and enjoy! There’s always a few roast potatoes that don’t get snapped up. Slice them up, get a oven-proof pan on medium heat with a good glug of olive oil. Warm the potatoes up in the oil, then add 5-6 eggs, lightly beaten with plenty of salt and pepper, to the pan. Turn the heat down to medium-low and cook for about 8 minutes, until the base has cooked. Meanwhile heat the grill. Put a plate over the pan and carefully flip the tortilla out, then slide back into the pan. Place the pan under the grill to cook the top, about 5 minutes. Slide out from the pan and cut into wedges. It’s delicious hot or cold, served with a dollop of mayonnaise. What’s your favourite Christmas leftover recipe? Get the kids involved on Christmas morning making these irresistible peppermint chocolate truffles to serve with coffee or a glass of eggnog. 1. Pour cream into a saucepan; bring to a boil over medium heat. 2. Remove saucepan from heat. Add all chocolate and stir until melted and combined. Add butter, stir until melted. Add peppermint essence, stir until combined. 3. Pour into a bowl and cover with plastic wrap. Refrigerate for at least 4 hours. 4. Line a tray with baking paper. Place spoonfuls of chocolate mixture on tray. 5. 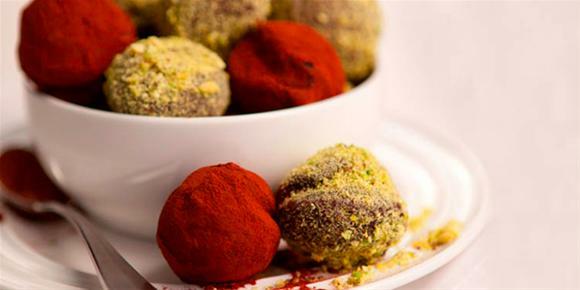 Dust your hands with crushed pistachio nuts or cocoa powder, and gently form spoonfuls into balls. Roll each ball in either nuts or cocoa powder.Refrigerate until firm. Store in fridge until ready to serve.